This is a simple, tasty dish that you are sure to enjoy. It isn’t hard to put together or to cook…since the slow cooker does most of the work. Wash and chop all vegetables. Keep onions separate. Heat large skillet over medium-high heat until hot. Add cashews. Cook and stir 2 to 3 minutes or until cashews begin to brown. Transfer to plate; set aside. Add vegetable broth and onions to heated skillet. Cook and stir 6 minutes or until richly browned. Transfer to slow cooker. 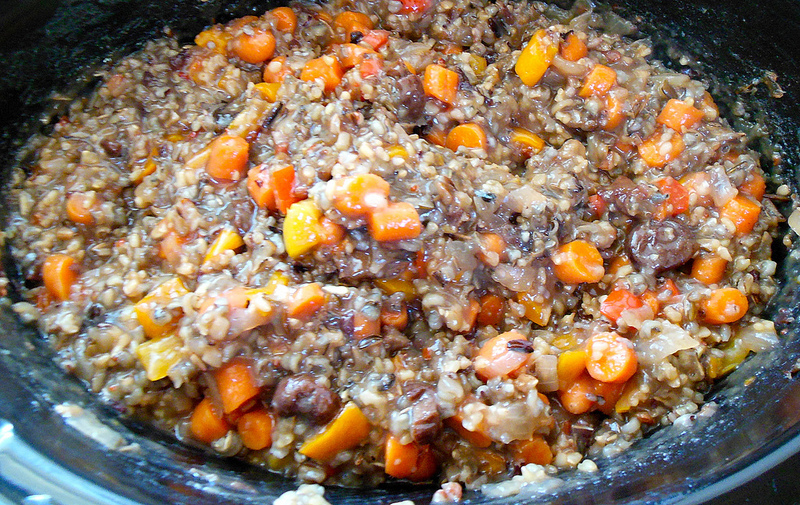 Stir in wild rice, carrots, bell peppers, cherries, red pepper flakes and water. Cover; cook on High 3 hours. Let stand 15 minutes, uncovered, until rice absorbs liquid. Stir in soy sauce and cashews.